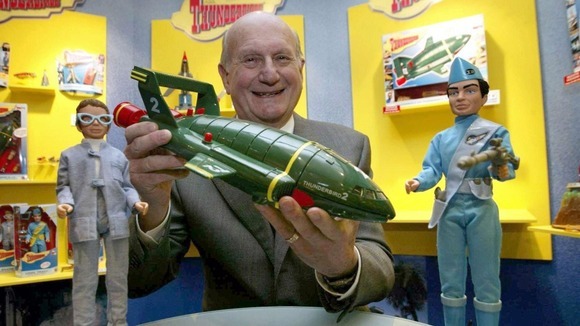 Gerry Anderson, the creator who brought us the puppet-adventure classic Thunderbirds, has died. Anderson announced in June that he was suffering from alzheimer's disease. He had planned to take part in a charity walk this autumn, but was not well enough to attend. Anderson recently moved into a care facility to cope with his rapid decline in health. His son announced today at noon (UK time) that Gerry passed away. 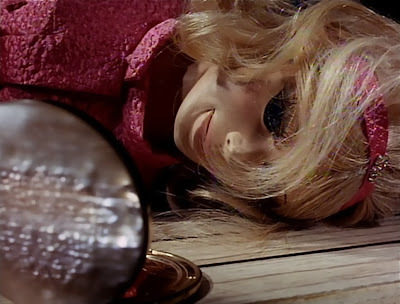 Gerry Anderson worked with his wife Sylvia to create a string of hit shows that went on to cult status. 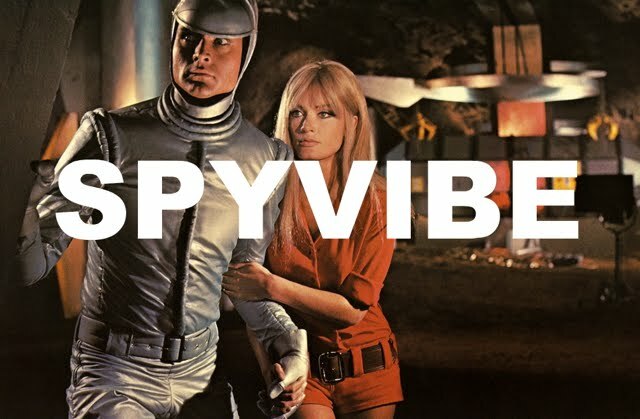 Although they set out to develop essentially children's programming, their knack for combining adult-style intrigue and adventure, science fiction gadgets, modern fashion, groovy music, and exotic sets pushed them into international stardom. Their most popular creations include Supercar (1961), Fireball XL5 (1962), Stingray (1964), Thunderbirds (1965), Captain Scarlet and the Mysterons (1967), and the live-action hits UFO (1970), The Protectors (1972), and Space 1999 (1975). Ingenious and inventive, the Anderson style influenced many filmmakers. Nick Park infused his Wallace and Gromit films with Thunderbirds-inspired gadgets and transforming sets. Can puppets be cool? Look at the opening sequence to Captain Scarlet below, followed by the absolutely groovy opening to Anderson's first live-action show, UFO. 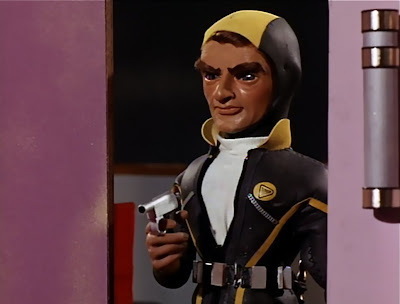 Gerry Anderson has been a celebrated hero here on Spy Vibe. 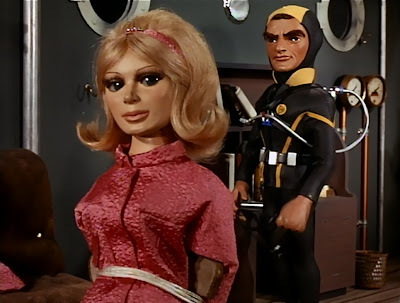 Some of our past posts include Gerry Anderson Announces Health News, Gerry Anderson UFO Movie, 1967 Anniversary of Captain Scarlet and The Prisoner, Thunderbirds License to Kill Puppets, and scroll down our Set For Adventure page to see our Set Countdown #9. 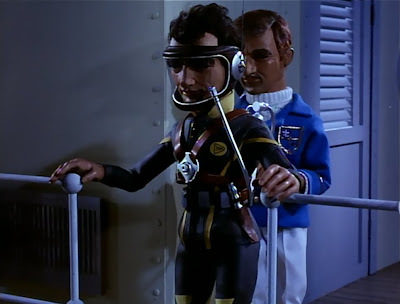 Check out YouTube for My Thunderbird: The Gerry Anderson Story. 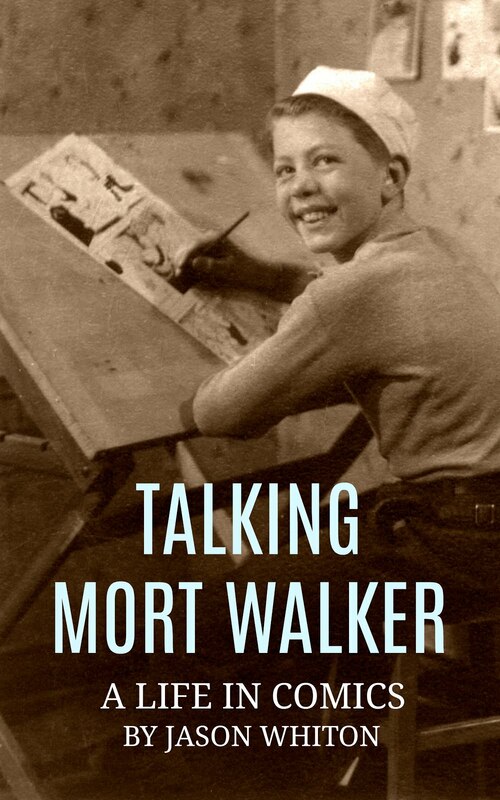 I also recommend the books, Filmed in Supermarionation, Sylvia Anderson's My Fab Years, and The Future Was Fab: The Art of Mike Trim. Anderson image above from ITV. 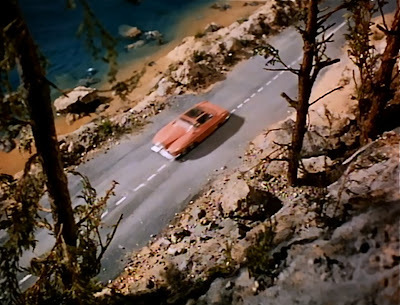 In tribute to Gerry Anderson, here is our original 2009 coverage of the James Bond-inspired Thunderbirds episode The Man From MI5. 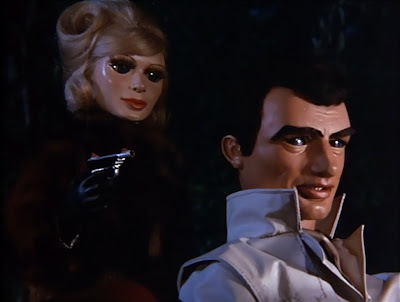 License To Kill Puppets: The year was 1965 and the world had been thrown into James Bond-mania. Thunderball, the Bond adventure to save the world from two stolen nuclear bombs, was about to debut in theaters. Meanwhile, a group of technicians and plotters were working to unleash their Agent Bondson to UK audiences on the small screen. Agent Bondson? 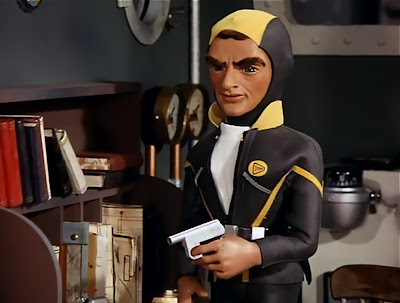 The rugged spy Bondson, who closely resembled Sean Connery and found his name in tribute to Fleming’s character, appeared in the Thunderbirds episode, The Man From M.I.5 on January 20, 1966 (disc Vol 7 of the original A&E megaset). With a Bond-style score by Barry Gary, the episode had a wonderful tone of danger and international intrigue. 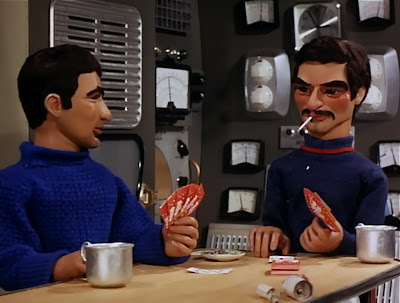 Long before viewers were shocked by the likes of Mr. Bill, Team America, or Robot Chicken, Gerry Anderson’s puppets were smoking cigarettes, tying up super models, and carrying out assassinations. If you have only seen the Thunderbirds films and are looking for something with a spy edge from International Rescue, this is one to check out. *spoiler alert. 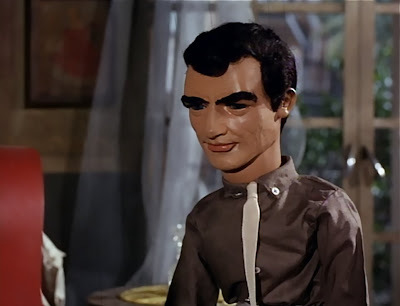 The Man From M.I.5 begins with a shocking puppet murder! A mysterious scuba diver sneaks aboard a yacht and shoots a British agent in the back- five times. He dives back into the water and blows up the boat. 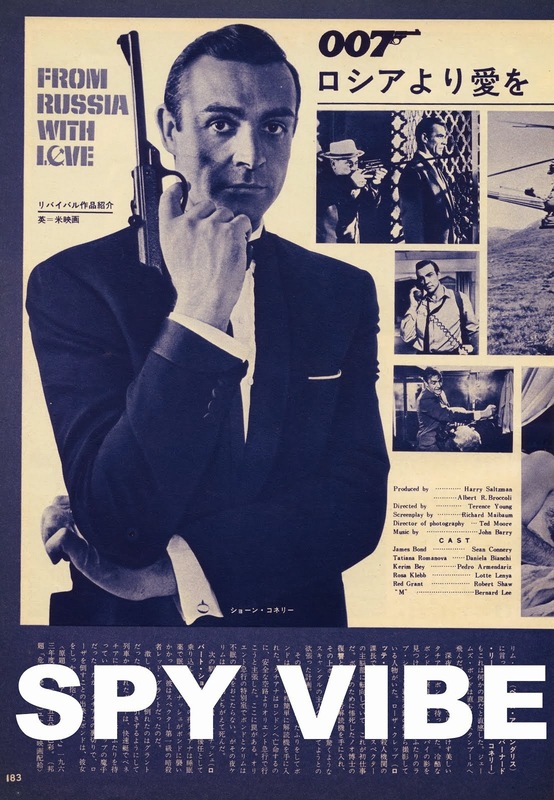 Agent Bondson investigates and discovers that his agent contact has been shot (“five times”) and that the stolen plans for a deadly nuclear device are missing. With world survival in the balance, Bondson calls on International Rescue to help recover the plans. 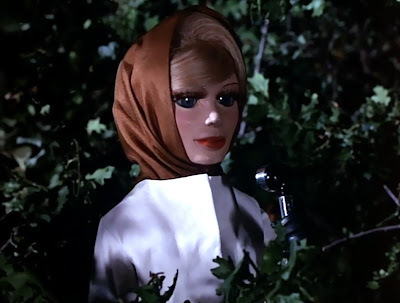 Bondson is called to a secret meeting in the woods by Thunderbirds “London Agent,” Penelope. He feels a pistol jabbing him from behind, announcing her arrival from the shadows. The dangerous tone of the story is pressed as she warns him, “Move a muscle and I’ll blow off your head.” These puppet spies are serious! 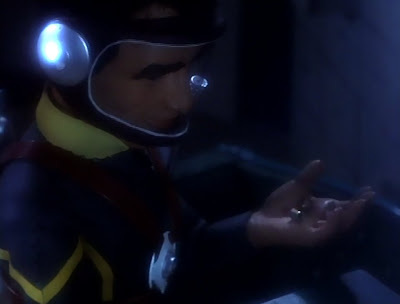 Penelope manages to open her communicator compact and open a channel to Thunderbirds HQ. A series of coded hand movements and tapping passes between her and HQ, but they are interrupted when the baddie ties her to a chair. His plans? He’s planted a bomb in the room to kill two birds with one stone. “At the right moment, we detonate the bomb. The patrol boat comes in shore to investigate the explosion. You die and we will escape [the radar].” Once he leaves her to her doom, Penelope tips her chair to the floor so she can warn HQ. The suspense is drawn out to allow the various (and cool) vehicles of International Rescue to search for Penelope and the enemy agent sub. 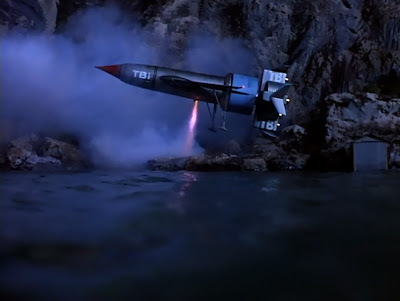 The Thunderbirds aquanaut saves the day by shooting knockout gas into their ship. The detonator switch is not pulled, and the plans are recovered. In a final meeting, Agent Bondson is led again into the woods by Penelope- who speaks to him through a microphone. He finds the plans to the nuclear device hidden in a tree (a classic dead drop), and the two exchange the gratitude of their agencies. Bondson is given a final and deadly warning to never try to trace Penelope or attempt to investigate the identities of International Rescue. 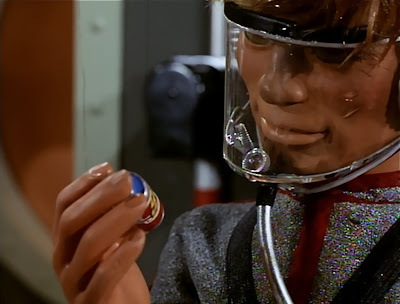 As someone who has focused mainly on Anderson’s espionage/sci fi shows (UFO, Captain Scarlet), it was a treat to explore this Thunderbirds “mission.” The story, dialog, score, and camera work all allowed the crew to pay homage to the spy film genre. The Bond connections are clear. Special Effects man Derek Meddings even went on to do the Bond films The Man With the Golden Gun, The Spy Who Loved Me, Moonraker, and For Your Eyes Only. As mentioned, Agent Bondson resembles Connery's alter ego in face and in name. 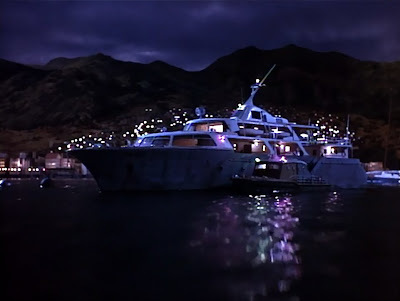 Even the scuba action was reminiscent of Goldfinger and Thunderall (which would also include yacht locations and props). 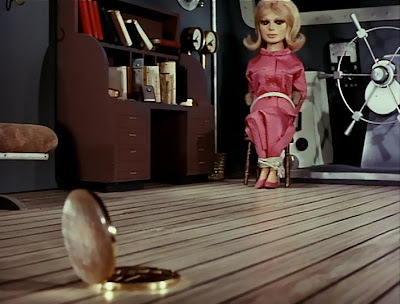 Beyond gadgetry and FX, Gerry and Sylvia Anderson often gave their shows adult-style thrills and spills, which is a main reason they continue to endure. Their puppets killed! 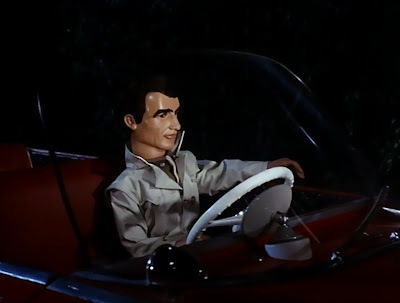 The Man From M.I.5 brought a fantastic sense of style and danger to Thunderbirds that Spy Vibers will enjoy.